Sometimes it’s better to wait awhile before expressing an opinion. 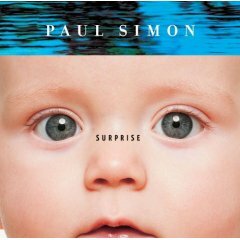 If I had written this piece six months ago when I first heard Surprise, Paul Simon’s much anticipated collaboration with ambient music pioneer Brian Eno, I would have written a much different review. I’m not a musical purist, not by any stretch, and the idea of Simon and Eno working together did not seem as disparate and untenable to me as it did to others. As a longtime fan of both artists, I was dying to hear what kind of music the two men could create together. After all, both musicians have been at the vanguard of what commonly is called world music; their careers have been characterized by risky stylistic maneuvering; and they have maintained trajectories that have been delightfully oblivious to whatever musical style happens to be in vogue. Therefore, I was expecting a masterpiece, and I wanted to be dazzled as soon as I unwrapped the CD and pressed "play." Yet, when I heard How Can You Live in the Northeast, the first song on Surprise, I was terribly disappointed. All of the textures seemed wrong. Eno and Simon didn’t appear to be hearing one another. Where their sonic palettes met, they clashed rather than complemented each other. I repeatedly tried to listen to the album, constantly skipping tracks in a desperate attempt to find something I would like, something I would want to hear again. It all sounded like fingernails on a chalkboard to me, and I reluctantly decided that the disc was a washout, something that was interesting on paper, but, for a variety of reasons that I hadn’t yet figured out, was an utter failure. Nearly five months passed before I decided to give Surprise another chance. Maybe, I reasoned, I had ruined the album for myself because I had expected too much from it. So now, expecting nothing and hoping for no more than to get through a song without skipping ahead, I listened to Surprise from start to finish, four times in a row. In doing so, I began to hear what wasn’t obvious to me at first. That is: this is the best album that Paul Simon has ever released, and it achieves its tremendous heights of vision because Eno understood completely what Simon was trying to accomplish musically and lyrically on each of the disc’s 11 tracks. Before you think that I’m trying to atone for my previous slagging and oversight with hyperbole, I must state that I am well aware that in singling out this effort from amongst all of Simon’s work as being the one for which he should be remembered, I’m comparing Surprise with a canon that many people consider to be sacrosanct. I have been a fan of all of his solo outings from the confessional songs of the ’70s to his groundbreaking pursuits on Graceland to his underappreciated 2001 endeavor You’re the One. I still believe that this comparison stands up. The reason is that, at age 61, Paul Simon is taking risks with form and content that he never before has attempted. While it’s true that Simon always has had an acute ear for melody and that he often has been ahead of his time in terms of the elements that he has incorporated into his songs, he never really has challenged traditional song structure like he does on Surprise. As much as I still love Graceland and as beautiful as the South African accents are in songs such as Diamonds on the Soles of Her Shoes, the exotic harmonies and guitar lines do little more than decorate the melodies; they don’t challenge the essence of the material’s inherent architecture. Twenty years after their release, the compositions on Graceland remain lovely, but they aren’t nearly as monumental as they initially may have appeared. Conversely, Surprise isn’t simply a collection of pop songs with decorative touches that are provided by a renowned ambient craftsman. Nor, is it a dry, academic exercise in form. Simon’s melodic sensibilities are intact, and there are underpinnings of traditional pop music in evidence everywhere. He is just too tuneful and melodic to write songs without hooks and hum-able melody lines, but these melodies exist as a skeleton that gives adventurous listeners something to hold onto as they ride through this phenomenal song cycle. From the disc’s second track Everything about It Is a Love Song, it’s obvious that Simon has taken every available opportunity to abandon traditional song structures. Tempos and melodies change regularly, and careful listening reveals that musical phrases are sculpted line-by-line in order to accentuate the lyrics — without regard to maintaining a traditional verse-chorus-verse format. There are sub-verses within verses, and bridges that arise in the strangest of places. Eno’s meticulous sound sculpture is staggering in its sensitivity. He illustrates every line of poetry with an aural painting that evokes the depth and hints at the sub-text that lies within each carefully chosen word. This is most evident in the fifth track Wartime Prayers. As the music shifts through folk, anthemic rock, gospel, and spoken word, it offers more than a mere demonstration of stylistic virtuosity. It echoes each uttered lyrical sentiment, following the narrator as he tries to make sense of war through every avenue that is available to him — from faith to resistance. "Who’s gonna love you when your looks are gone? Take me, I’m an ordinary player in the key of C."
Surprise is available from Barnes & Noble.